One of our Fashion e-commerce clients started a Customer Loyalty Program with the aim of maintaining a stronger, more meaningful, relationship with their loyal customers, and motivating their occasional customers to become loyal. Such programs reward customers who frequently make purchases with discounts, coupons, points, or merchandise gifts, and often require the customer’s membership. Our client found that this would be a valuable addition to their marketing strategy because even though only 1.6% of their customer base form their most loyal customers, they represent a disproportionately large contribution of 10% of our client’s annual revenue. The CMO of our client sought to leverage the loyalty of their customers by envisioning their Customer Loyalty Program from the perspective of motivating their occasional customers to become loyal. The CMO conceived a tier-based system where customers could advance from a lack of relationship to a £50+ level of engagement, from £50+ to £100+, and so on, up to a maximum level of £500+. Each of these levels represents the total historical value of a customer’s purchases within a time frame of one year. Analogous to a “6 shoes for the price of 5” offer in a high street brick-and-mortar store, once a customer reaches the level of £500+ in purchases, the customer will be rewarded with a free pair of shoes. The intended result of this strategy would be that each of the customers in these tiers would advance by one tier (see the chart beneath). However, upon evaluation of the implemented Customer Loyalty Program, our consultants found that the program was hard to discover; the Loyalty Program was only discoverable at the bottom of the Home Page, by a medium-sized image in the corner. But it also was burdened by the lack of clear, overt communication of the customer’s standing with the program. There weren’t any means available to the customer to know what their membership status is, and how much they still need to spend to be eligible for a reward. Despite this setback, our client decided that it made more economic sense to his business to further pursue a successful implementation of a Customer Loyalty Program. The CMO’s reasoning behind this decision was that when new customers are acquired on platforms like Google and Facebook, nothing is known about the customer’s intent to develop a long-standing relationship with the business. On the other hand, a Customer Loyalty Program addresses and nurtures those customers who consider it beneficial to engage in such a relationship. As these customers tend to buy more over time and refer others to the business, the cost/benefit ratio significantly favours the loyalty program over an acquisition strategy. The program acts upon insights derived from customer lifecycle or behavior analyses. The program is designed with a clear understanding of its added value to the customer. The business employs a communication strategy that uses the loyalty program as a leitmotif throughout all communications with the customer. A customer lifecycle approach to a Customer Loyalty Program involves the use of RFM analyses to identify the actionable stages of the lifecycle. Email marketing scenarios can then be tailored to prevent customers from going to sleep, or even churn. What is generally known about the customer lifecycle in online stores is that customers tend to make homogeneous purchases and that the purchase rate significantly decreases after two consecutive purchases. This type of shopping behavior can also be turned into actionable stages, where a variety of offers (e.g. time-limited discounts or free shipping) can be made to motivate the customer to make the third purchase. The added value to the customer and the strategy for communicating the customer’s standing with the Customer Loyalty Program are strongly intertwined. A good practice example of a communication strategy is found in the Customer Loyalty Program of a group of lunch restaurants that mainly serve office employees. They operate a points-based system where the customer receives points for each consumption at any of the participating restaurants. Once enough points have been acquired for a free drink or lunch, the customer will receive an email with a reward voucher. Obtaining the reward is as simple as scanning the voucher at the cash register of the participating restaurant. The success of this loyalty program lies in the practical benefits these rewards offer to the customer, combined with a low threshold to obtain these rewards. It doesn’t take much effort to acquire the points required for a free drink, as the customer base visits these restaurants on a daily basis. Our client, however, does not have the rate of purchases per customer of a restaurant. Points-based systems tend to be ineffective and unnecessarily complicated if the offered items are only purchased at a rate of several times a year per customer. Our consultants concluded that a program based on gamification fits with the interests of the client’s customer base, and is easy to implement in their current email marketing operation. In this scenario, the customer’s total value of purchases is used as a score to indicate the progress in obtaining the reward of VIP membership. This score will be presented as motivational messages to complete the journey of becoming a VIP. The techniques used to realize this program are explained in the below paragraph. Exponea’s Data Management Platform has the ‘Aggregates’ feature. This feature collects data about customer events, such as item purchased, and their attributes, such as item price, within a range of a particular time span and performs calculations on them. In the case of our client’s Customer Loyalty Program, this feature was used to calculate a customer’s total amount of purchases over the last year. The author Rajat Paharia defined gamification in his book ‘Loyalty 3.0’ as the process of taking something that already exists – a website, an enterprise application, an online community – and integrating game mechanics into it to motivate participation, engagement, and loyalty. 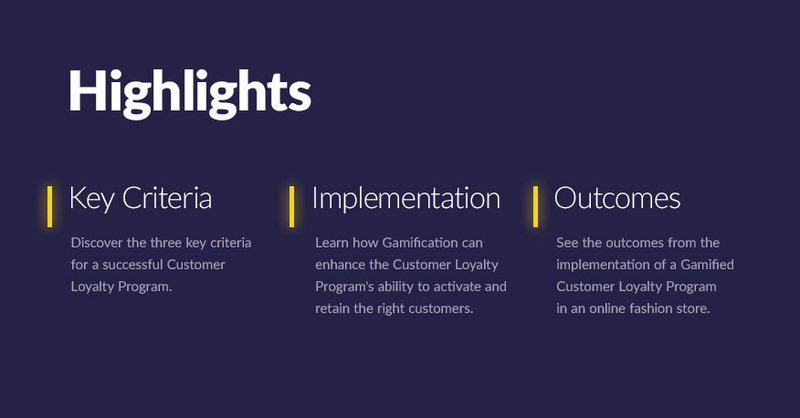 One of the most straightforward ways to apply game mechanics to a Customer Loyalty Program is to re-envision the program’s tiers as video game levels, where customers can advance to a higher level by completing one or more tasks. Customers are generally intrinsically motivated to pursue rewards in such a gamified environment. The client’s customer data is managed using Exponea, which is also responsible for calculating every customer’s score regarding their total value of purchases in real time. This score is then presented on the homepage and is also used to enhance the client’s existing email marketing scenarios. The customer’s score is presented on the homepage as a remaining value to spend. This banner also informs the customer about the added value of being rewarded with the VIP membership. All emails sent to the customer contain either a header or footer detailing the customer’s standing with the Customer Loyalty Program. 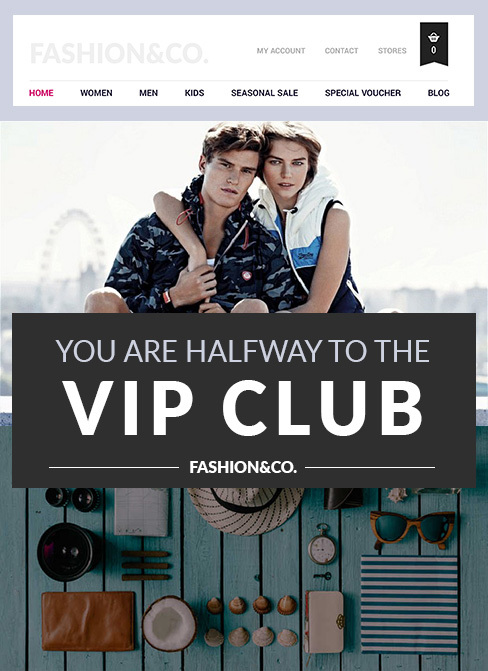 The customer will also receive a separate email notification if a key milestone is reached on the journey towards VIP membership, such as being ‘half-way there’ or ‘almost there’. The resulting Customer Loyalty Program was A/B tested against a control group. The Variant A group was made aware of the program by receiving all the email and on-site communications, while the control group wasn’t made aware of the program’s existence. The outcome of this test shows that this program reaches its intended goal, to nurture those customers who consider it beneficial to engage in a long-standing relationship with the client’s business, with an increase in total revenue of 11.03%. 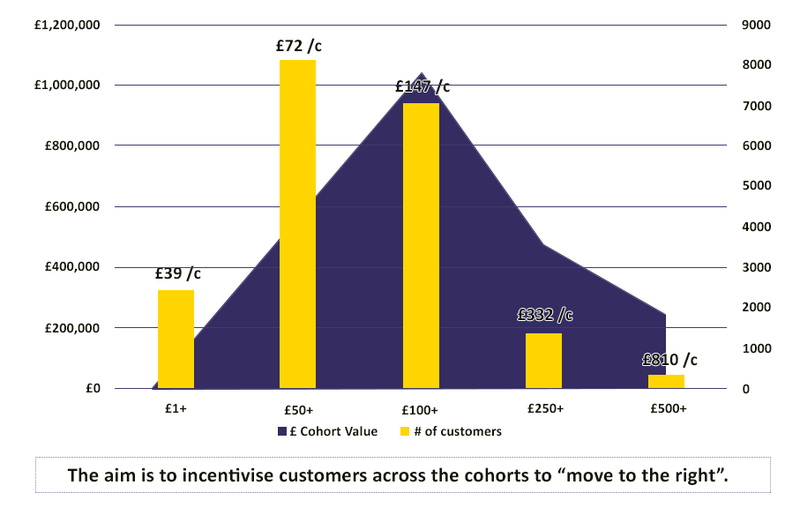 The cohort that has a total value of purchases between £100 and £250 can also be easily identified as the type of customer who finds it appealing to develop this long-standing relationship. These outcomes also point out that the prior-mentioned key criteria serve as dependable guidelines for conceiving and implementing a Customer Loyalty Program, therefore confirming that these can be usefully applied to enhance the customer lifecycle in future client engagements.